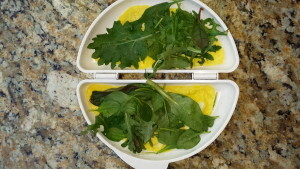 A easy, delicious nutritious omelet can be made with one of my favorite kitchen gadgets the Nordic Microwave Egg Maker. Click on the link and it is on page 3 of the Amazon Recommended Products. Look how much food you get for only 270 calories! 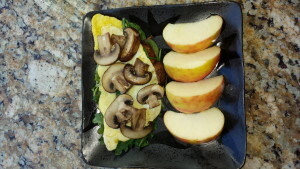 The omelet with the greens and sauteed mushrooms provides 200 calories, 12 grams of protein and 3 grams of fiber. Serve with half a sweet honey crisp apple which adds another 70 calories and 4 grams of fiber. To make the microwave omelet, beat two eggs in a small bowl; divide the mixed eggs equally into the two sides. Place in the microwave for one minute and then check doneness. Continue with another 30 seconds until almost set. If you want to add greens, place some on top and continue another 30 seconds until egg is done to your liking. 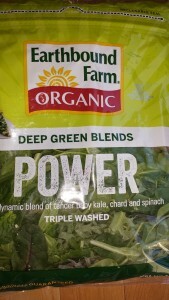 I like to use Costco’s Organic Triple Washed Power Greens (Baby kale, chard and spinach). I always buy organic greens since they can be contaminated with pesticides and/or herbicides. For the other produce that is critical to buy organic see my article on the Dirty Dozen). Flip one side of the omelet maker onto the other and slide the omelet onto a plate. I like to top with sautéed sliced crimini mushrooms. The Environmental Working Group (EWG) has released its list of the most pesticide-contaminated produce called the Dirty Dozen. Shopper’s Guide to Pesticides in Produce. Pesticides have been associated with developmental problems in kids, and cause cancer or disrupt the endocrine system, according to the U.S. Environmental Protection Agency. Consider purchasing organic varieties of these fruits and veggies, and be sure to pick plenty of produce from the Clean 15 list .